See the winners of XYZ’s 4th-anniversary website building contest in this week’s #WebsiteWednesday! For the past two months, in conjunction with our 4th-anniversary campaign, we’ve been holding a website building contest. If you’re a regular reader of our blog, you’ll know that the 4 winners will each be receiving an iPad Pro and a $500 donation made to the Electronic Frontier Foundation (EFF) on their behalf from XYZ. Is the domain name short, memorable, and brandable? What is the purpose of the website, and does the design accomplish that goal? Is the website suitable for the business’s industry? Does the website match the target audience? Do the links and shortcuts help the user navigate the website? Does the website thoroughly provide all necessary information? Is the content readable, useful, and concise? Are there relevant social media links? Does the website style match the business brand? Is the style consistent throughout the website, and does it appeal to the target audience? With that criteria in mind, here are the winners of the XYZ anniversary website building contest! It’s no secret that the world all but runs on technology nowadays, and with our greater reliance on smartphones and other internet connected devices, our personal information has been put at a higher risk than ever before. 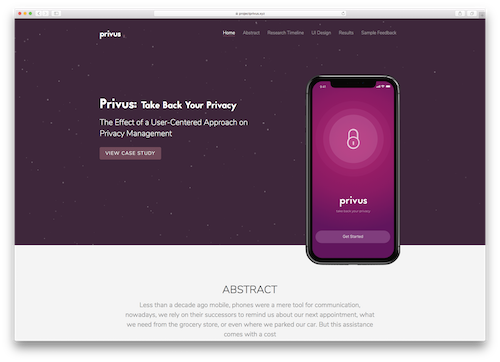 As a software engineer with a Master of Science, Information Assurance and Cybersecurity, Aral Tasher devoted his masters’ thesis to fixing this issue, and created ProjectPrivus.xyz to share not only his findings, but to give an easily digestible overview of his research, and a preview of his “Project Privus” service he proposed as a solution. Aral’s site has an impeccable modern style, well organized content, and an inviting color scheme, all on a perfectly branded domain. 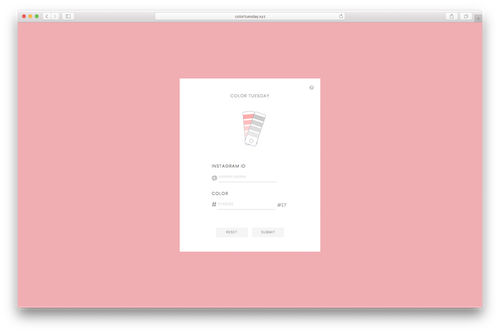 Linking your social media to your website is a great way to unshackle yourself from the limits of social media platforms and create a truly unique experience, which is exactly what Sasha Tran did with her site ColorTuesday.xyz. Sasha connects her followers with ColorTuesday.xyz by having them choose a color they like, then shouting them out each Tuesday on her Instagram profile. Her domain name inspires curiosity and invites participation, and the unique color changing tool she created on the site is a great feature that strengthens her personal brand online and invites more visitors to her social media page. 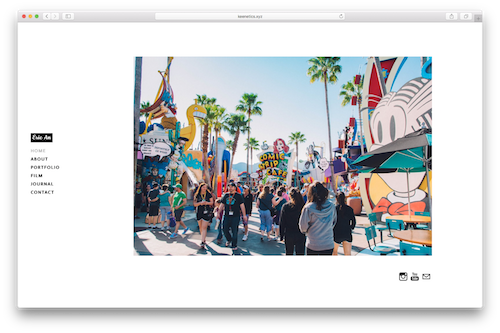 With his mix of film, photography, and personal writings, artist and Keenetics.xyz creator Eric An has molded a superb personal site that brings you into his world, while offering an easily navigable layout that lets you peruse the online halls of his work. Add to that the clever portmanteau of “kinetic” and “keen” as Eric’s chosen brand name, and you get a truly complete representation of how to express your artistry on a personal website. Many coders and web developers know the struggle of having a breakthrough idea about a project they’re working on… while they’re away from their computer with no way to work on it. Codeful.xyz is aiming to change that by developing a service that allows developers to work on their projects via their mobile device. 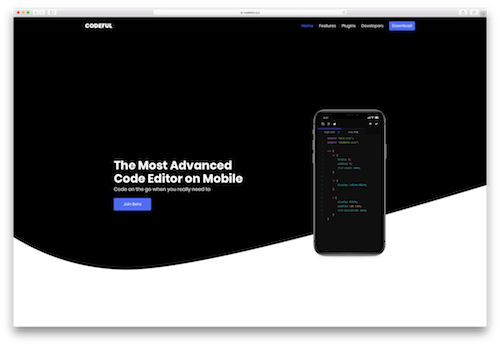 With an easily navigable layout and straightforward domain name that provides all the pertinent details to its target audience, Codeful.xyz is a fantastic example of how to create a website that promotes your app or product. Lawyers.xyz – Personal injury law-firm with an excellent keyword domain name to match. OceanaLife.xyz – A digital oasis in both blog content and aesthetics. Future16.xyz – A great example of displaying portfolio work in the entertainment industry. W-T.xyz – This web toolbox is creative in its content and execution. SoftWork.xyz – Call to action buttons make for a great website – it allows the visitor to clearly understand what the site’s purpose is. The CTA buttons on this site are no different. AndreGonzs.xyz – This personal portfolio site is clean and easy to navigate. Lisiri.xyz – A creative way to display social media links, and the customized cursor is a unique added touch! HappyHealthyHolistic.xyz – This blog is an awesome example of how to bring your hobby to life on a .xyz domain! ToTheRescue.xyz – A philanthropic platform for various charities and donation centers; an amazing way to give back to the community! CAC.xyz – This social media-linked personal site draws visitors with a very short and memorable domain name. Congratulations to all the winners, and a big thank you to everyone who submitted their awesome .xyz sites and supported our 4th-anniversary campaign by participating. We’re so proud to have had the support of #GenXYZ in our fight for internet freedom and innovation online, as together we raised over $10,000 to donate to EFF and Tsinghua x-lab. Be sure to read our 4th-anniversary campaign recap if you haven’t already, and tune in the rest of the month as we’ll be highlighting each of the 4 winners sites in their own #WebsiteWednesday posts! « Previous Post Coming August 1st: Premium .XYZ names with $10 renewal prices!